The Reporting And Analysis addon allows you to analyze your results using a variety of charts and allows you to filter and export the data as well. Once you have purchased the addon, you will have access to download the addon. To install, simply upload the addon as a normal WordPress plugin. To do so, go to the Plugins page and click Add New. Then, click Upload. From there, upload the zip file that you downloaded when downloading the addon. Once the addon has uploaded, you should now have the plugin QSM - Reporting And Analysis listed in your list of plugins. Activate that plugin. Once activated, the plugin will add a new tab on the Addon Settings page labeled Reporting And Analysis. To begin using this addon, go to the new tab on the Addon Settings page and enter the license key from your account. Now, you can begin analyzing your results. Go to the Results page and click on the Reporting And Analysis tab. Now, you have to select your quiz and click the Analyze Quiz Results button. Once the results load, you will see the general information. Below that will be the answer information. You can also filter the data based on several different components. Once you chose your quiz, a filter results section will appear. You can filter by a date range, user id, business, or name. To do so, simply enter whichever you wish to filter by. If you want to analyze results only from a certain business, simply enter in the business and leave the other fields blank. You can also filter by more than one thing as well. Once you enter in your filters, be sure to click the Filter button to re-analyze. You can then also export the data as a CSV file to be imported to a variety of spreadsheet software including Excel and Google Sheets. You can use the export feature with or without the filters. By using the filter, you can export only data in a certain time frame, by a certain user, by a certain name, or by a certain business. If your results are in a language that supports accented characters, you may notice some odd things in your export if you are opening the file in Excel. If you do, please read our Getting Excel to properly show accented characters documentation. 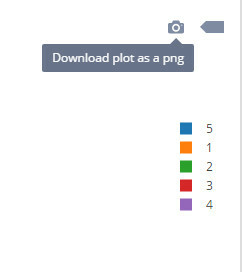 To export any graph as an image, hover over the image to see a camera icon appear in the top-right corner. Click on the camera icon to download the image. Each question will have 7 different buttons above its graph. You can use these to switch between types of charts. By clicking on the "Bar Chart" button, the data will be used in a bar chart. You can also use the "Word Count Chart" button to use the data in a word count chart. This is useful if you have an open answer type of question and want to see the most used words. For question types of "Multiple Response", you can choose the "Multiple Response Chart" button to see the individual answers graphed. You can click on the "Question Score" button to see the average score earned for that question. Using this data, you can quickly see what questions users have the most trouble with. Lastly, the "Individual" button will show you all of the answers provided for that question. This is useful for quickly looking through answers to open answer questions.